As promised on Saturday here is part one of my list of books which I have read and enjoyed this year. Some are new and first time of reading, others older and re-reads, but I can recommend all of them. 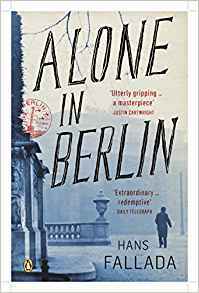 Alone in Berlin by Hans Fallada is my current read and a powerful evocation of what living under Nazism was like for ordinary apolitical German folk. First published in 1947 it has much the same atmosphere of intense fear and suspicion as Nineteen Eighty-Four, published two years later, though Berlin was, of course, real and the writer acts as witness. He delivers a densely plotted, humane story as a reminder of what behaviour results when a faction or party, with extreme beliefs and a penchant for gangsterism, achieves power. The plot, based on fact, is gripping and, ultimately life affirming, although I’m not giving anything way when I say that the end is also a sad one. A big, meaty read. My next three books are part of the Canongate series, revisiting the classic Greek tales, but also Norse and Christian mythology. Margaret Atwood had an amazing 2017, with Channel 4’s masterly adaptation of The Handmaid’s Tale and Netflix’ Alias Grace (I don’t have Netflix so haven’t seen the latter, but people I know say it’s good). 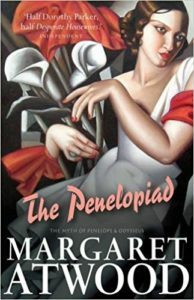 I have Hagseed waiting on my book shelf, but in 2017 I re-read The Penelopiad (2008), her retelling of Homer from Penelope’s point of view. Similar to another of my Books of 2017, below, in that all the protagonists in it are dead, this tale is told from the fields of ashphodel. The tone is often deceptively gossipy and light, but make no mistake, this is utterly damning of the macho world of Illiad and Odessey. The twelve dead maids, murdered in an act of male vengeance by Telemachus and Odysseus, guilt-ridden and suspicious respectively, act as a Chorus, with comment and songs both witty, scabrous and sad. Weight by Jeanette Winterson (2006) is another in the series, this time retelling the tale of Atlas and Heracles, interspersed with auto-biographical recollections and musings. Heracles needs Atlas’ help, but must also risk taking on Atlas’ burden, though the nature of that burden is questioned and it makes one consider attempts, possibly by all of us, to escape from what we ‘carry’ with us. Winterson explores responsibility, coercion, free will and self-delusion, drawing entirely believable characters in sometimes stunning prose. I enjoyed this when it first appeared and I have enjoyed re-reading it this year. My fourth book is Ragnarok by A.S.Byatt (2011). Byatt is one of my favourite writers, I have read everything she has published and regularly re-read her. 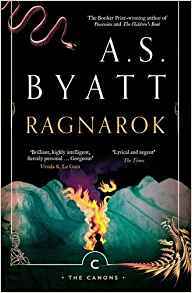 Ragnarok is the End-time or Twilight of the Norse Gods, when all is destroyed and Byatt tells the story of Asgard as read by a child evacuated to the countryside with her mother during WWII. The ‘thin child’, representing Byatt herself, reads two books, Bunyan’s Pilgrim’s Progress and Asgard and the Gods and enters into the myth. The child, like the writer she becomes, revels in language, of the stories and the story. The words echo and scintillate, the experiences they summon resonate within the reader’s mind, just as the myths resonate within the child, from a summer’s meadow walk to the plain of the Last Battle, its colours are bold and iridescent. I will return to this book again, probably many times. I reviewed William Saunders’ Booker prize-winning Lincoln in the Bardo (2016) elsewhere on this site. Nonetheless, I include it here, for its compassion and humanity as well as its astonishing originality and virtuosity of form. I will return with more books, genre fiction and non-fiction, Part II of my list, later in the week. This entry was posted in Book Reviews and tagged Book reviews by juliej. Bookmark the permalink. Thanks Julie for a very interesting Story Bazaar year, and for Part I of your very interesting reading list.